The Ancient City of Bosra grew the most under the Romans, who paid great attention to it and was named Niatrojana Bostra as the capital of the state of Djezire under the king Trojan. In the Byzantine period Bosra became the seat of an archbishop who was in charge of 33 bishops in the area. 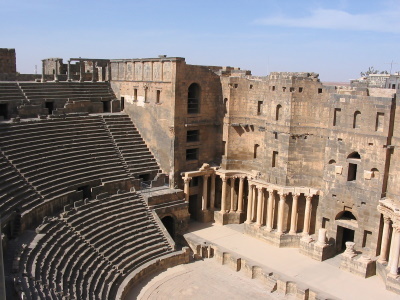 In 632 AD, Bosra was the first Byzantine city to fall to the Arab Muslims, and it flourished greatly as a point on both the trade route and the pilgrimage route between Damascus and Mecca. Great drive from Damascus to Bosra, really enjoyed it some interesting places to stop and eat. The Theatre was interesting, the basalt rock used to construct it seems indestructible. Not much else to see in the town though. It seems it later became a fort to defend the city. Paul Tanner's review is quite accurate. The intermingling of ancient ruins and modern housing makes for an odd feeling. Unfortunately some of the shells of ancient buildings have been used as garbage dumps by the residents. Walking down the streets you can come across the ruins of unexcavated ancient buildings in whose debris you can see fragments of Roman glass protruding. Besides the excelently preserved Roman theater, the site is notable for the use of black basalt stonework. It is so very different from the usual marble. There is so much still standing that a conservation program that includes relocating the current residents could make for a wonderful archaeological park. the great thing about this City is the fact that it survived about 2500 years inhabited and almost intact.the Romans, Nabateans, Byzanthine, Umayyad Muslims all left traces in it..it is simply an open museum. make sure to read about it before visiting or at least get a guide book to the numerous sites you are about to see or you will be lost and not really appreciate what you are seeing. you might wanna know how important it is to the Eastern Christians since it was a center of archbichop and it has many intact ancient churches. alo very important for muslims since in it prophet Mohammed has met the monk Buheira who was the first to forsee the child Mohammad's prophesy. It was also the second Nabatean capital after the sacking of Petra by the Romans. Bosra is a very strange “ruined town”. Its remains are primarily Roman and its star attraction is the well preserved 15000 seat Roman theatre. What is slightly disconcerting when visiting the place is the intermingling of current dwellings and ruins. People live inside the city walls in houses which either are or are partly built from or are next to “old” buildings. The streets still seem to be paved as in Roman days – yet have clapped out old cars parked in them (photo!). b. are determined to pick up all the Syrian WHS!! Damaged in War since WWII: Syrian Civil War "The ancient city of Bosra, located in the southern Daara governorate, contains ruined buildings from the Roman, Byzantine, and early Islamic periods. Between October 2009 and April 2014, a number of probable shell craters appeared within the site, including a hole in the roof of the Al-Omari Mosque." Ibn Battuta: "We marched to the town of Bosra, and thence to the castle of al-Karak."